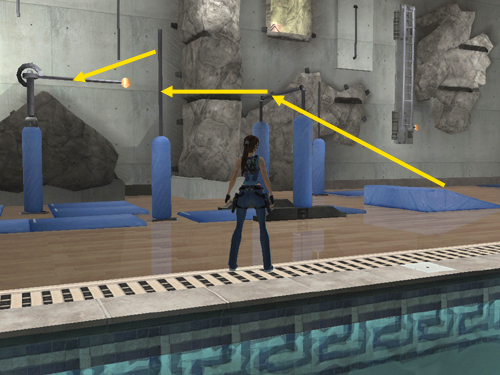 Just as you did when getting the previous reward, run up the blue wedge-shaped mat and jump to grab the nearest horizontal bar. Swing around it and jump to grab the vertical bar ahead. Jump to grab the movable horizontal bar. Swing around it and jump onto the right side of the sloping rock ahead. Before Lara slides off, jump to grab the crevice in the stone column. This time, climb around the corner to the right side of the stone column. Jump to grab the vertical pole extending from the floor. 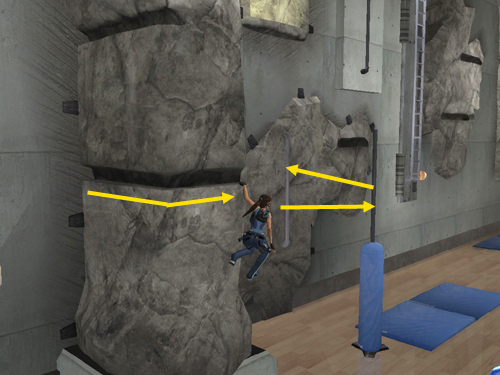 Jump to the vertical bar mounted on the irregularly shaped rock wall. Jump to the right to grab the horizontal crevice in the same rock. 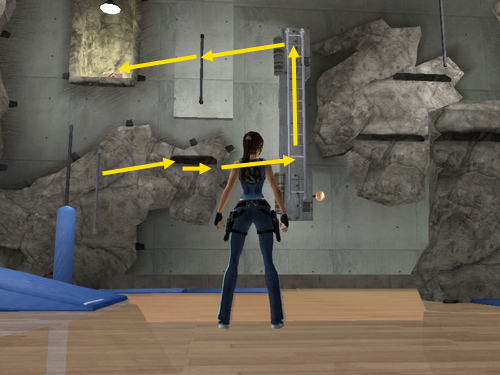 Climb to the right and then jump to the right to reach the ladder, which should still be flat against the wall. Climb to the top of the ladder. Jump to the left to grab the vertical bar mounted on the wall. Jump to the left again to the alcove with the bronze reward (11/16). If you want to go for the next reward from here, don't drop down yet.